Its important to know why your swivel rocker may need replacement cushions because you may be using a cushion that does not support you properly or it may be an eyesore even though it feels good. Taking the time to evaluate your swivel rocker cushion will ensure that you are using a cushion that properly comforts and is esthetically pleasing. 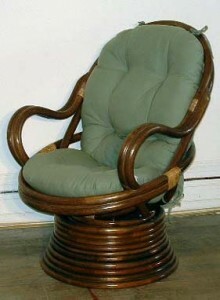 Luckily, it generally takes a long time for a swivel rocker cushion to wear to the point that it needs to be replaced. So, you should have plenty enough time watch for all the signs of wear and replace yours when its time. Very little can be done against wear once it happens, but we can monitor it before it becomes unsightly and causes discomfort. As cushions age, the threads in the seams can become loose or broken. This causes the definitive edges of the cushion to change appearance and if severe enough, the cushion filling will begin to protrude through the seams. Fabric becomes worn after signifiant use. Repeated friction from a person’s clothes against the cushion fabric breaks down the fabric surface and begins to make the fabric thinner. The thinning of the fabric will change the colors and begin to mar any fabric patterns. Eventually, a hole can form. Once the hole forms, the filling will start to come out. Polyester filling is generally used to fill rattan swivel rocker cushions. Although swivel rocker cushions are thick and generously stuffed, over time, the polyester will begin to break down and lose its spring, begin to flatten out and clump together. As part of the aging process the clumping together of the fill can make it uncomfortable. Not only can compressed and lumpy filling be uncomfortable, it may become unhealthy if you sit to long in the rocker. To ensure a good comfortable ergonomic sitting position on the swivel rocker, make sure that he the cushion is fully stuffed with no lumps. « Is Resin Wicker Waterproof?